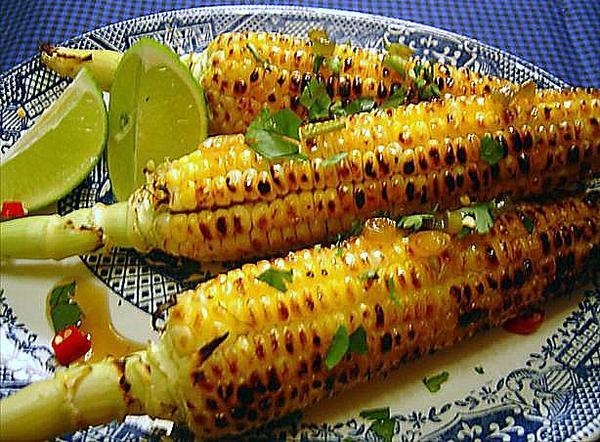 If you are not used to anything but simple grilled corn, you are certainly in for a treat! Although I know there are some eyebrows out there lifting just at the mere mention or sniff of fish sauce. Yes, fish sauce is extremely pungent, and can be rather off-putting when not used correctly. But trust me, if you follow Joyce’s recipe you will be happy, your guests will be happy and the sweetest part is that you don’t have to tell them how easy it is to put together. This is an excellent recipe from Savoring Southeast Asia, by Joyce Jue, 2000. I would serve this with any number of grilled recipes, including satay and bulgoki. But mind you, the corn tastes wonderful when paired with curry or stir-fries.